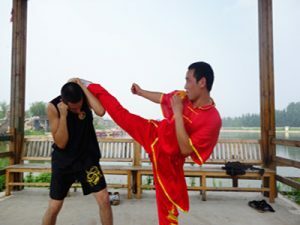 Han Shifu comes from a traditional Kung Fu family; He studied Meihua Quan from his father since he was 7 years old, which help him get good physical condition and lay a solid foundation for his Kungfu training afterwards. At the age of 13, he went to the Shaolin temple to learn Shaolin Kung Fu, became a deciple. He mastered Shaolin Kung Fu Fist, Animal Forms, shaolin grappling, and different weapons in 5 years He is specialized in Shaolin drunk style (drunk fist, drunk staff),Shaolin Animal-Imitation kungfu style and weapon training, especially double weapon(like double nine-section whip,double broadsword, double OX Horn hammer). After this, he went to public school for specialized and intensive Sanda training and attend a lot of Sanda competition at that time, so he is good at sparring now. He has more than 10 years of teaching experience, Han Shifu has a very friendly and opened a way of communicating with students, he shows the right methods of practising, and can help everyone to develop an individual Kung Fu style. He is well received by all the students. First place of both double whips and spear in teen-aged martial arts competition in Hui county,Henan province. First place of Xiao Meihua fist in China Mount Liang Meihua Quan Performing Competition. First place in Qi Gong and Shaolin Broadsword at the International Shaolin Wushu Festival in Zhengzhou, Henan Province. First place in Chun Qiu Broardsword (Chun Qiu Da Dao) at the International Wushu Festival in Changsha, Hunan province. First place in the 62 kg open combat categories at the National Wushu Festivel held in Foshan, Guangdong Province. First place in Shaolin drunk fist and drunk sword at International traditional Shaolin Martial arts Competition held in Chengdou Sichuan Province. First place in Meihua Staff and Meihua Sword at the International Traditional Martial Arts Competitions held in Liangshan, Shandong.